Bank & Vogue offers a wide range of houseware returns and overstock loads available, from a major North American bed and bath retailer. 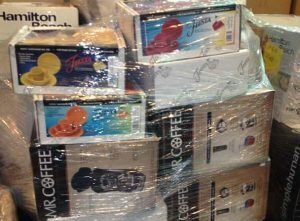 These loads are full of potential profit for your stores or business and include; coffee makers, bedding, bathroom decor, patio and furniture sets, kitchenware, storage solutions, small appliances, barware and stemware glasses, rugs and more. Home decor products including smaller unused furniture, unused bedroom furniture and lighting may also be included. All houseware returns are either store returns, wholesale liquidation or overstock loads. This means all houseware returns are in good condition as they are either a store return or were never purchased. Contact the Bank & Vogue team to buy wholesale hosueware returns for your store or business today. All houseware return loads are fully manifested, with the majority of products in their original packaging. All products are stacked on pallets and wrapped, for easy and safe transportation. These loads can be shipped domestically or exported with some restrictions, across North America or internationally. Our houseware returns include brand name items and high quality goods at a wholesale cost. 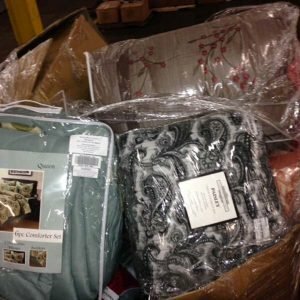 Contact Bank & Vogue today to determine the logistics of the buying and shipping process for your wholesale houseware returns today.